When the Apollo astronauts returned to Earth, they brought with them some souvenirs: rocks, pebbles, and dust from the moon's surface. These lunar samples have since been analyzed for clues to the moon's past. One outstanding question has been whether the moon was once a complex, layered, and differentiated body, like the Earth is today, or an unheated relic of the early solar system, like most asteroids. Ben Weiss, a professor of planetary sciences in MIT's Department of Earth, Atmospheric and Planetary Sciences, and members of his laboratory have found remnants of magnetization in some lunar rocks, suggesting that the moon once emitted a substantial magnetic field, much like the Earth does today. The discovery has opened a new set of questions: How long did this magnetic field last? How strong was its pull? And what sparked and sustained it? Weiss and former MIT student Sonia Tikoo have written a review, published today in Science, in which they explore the possibility of a lunar dynamo—a molten, churning core at the center of the moon that may have powered an intense magnetic field for at least 1 billion years. Weiss spoke with MIT News about the moon's hidden history. Q. How would a lunar dynamo have worked? What might have been going on in the moon, and in the solar system, to sustain this dynamo for a billion years? A. Planetary dynamos are generated by the process of induction, in which the energy of turbulent, conducting fluids is transformed into a magnetic field. Magnetic fields are one of the very few outward manifestations of the extremely energetic fluid motions that can occur in advecting planetary cores. The motion of Earth's liquid core is powered by the cooling of the planet, which stirs up buoyant fluid from the surrounding liquid—similar to what happens in a lava lamp. We have recently argued from magnetic studies of Apollo samples that the moon also generated a dynamo in its molten metal core. Our data suggest that, despite the moon's tiny size—only 1 percent of the Earth's mass—its dynamo was surprisingly intense (stronger than Earth's field today) and long-lived, persisting from at least 4.2 billion years ago until at least 3.56 billion years ago. This period, which overlaps the early epoch of intense solar system-wide meteoroid bombardment and coincides with the oldest known records of life on Earth, comes just before our earliest evidence of the Earth's dynamo. Q. Why is it so surprising that a lunar dynamo may have been so intense and long-lived? A. Both the strong intensity and long duration of lunar fields are surprising because of the moon's small size. Convection, which is thought to power all known dynamos in the solar system today, is predicted to produce surface magnetic fields on the moon at least 10 times weaker than what we observe recorded in ancient lunar rocks. 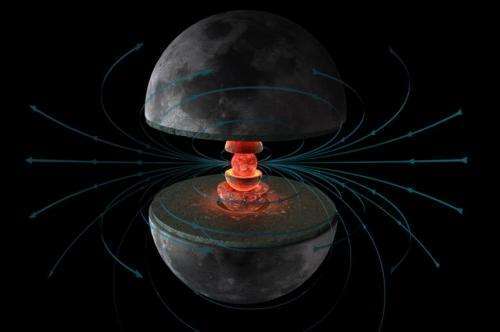 Nevertheless, a convective dynamo powered by crystallization of an inner core could potentially sustain a lunar magnetic field for billions of years. An exotic dynamo mechanism that could explain the moon's strong field intensity is that the core was stirred by motion of the solid overlying mantle, analogous to a blender. The moon's mantle was moving because its spin axis is precessing, or wobbling, and such motion was more vigorous billions of years ago, when the moon was closer to the Earth. Such mechanical dynamos are not known for any other planetary body, making the moon a fascinating natural physics laboratory. Q. What questions will the next phase of lunar dynamo research seek to address? A. We know that the moon's field declined precipitously between 3.56 billion years ago and 3.3 billion years ago, but we still do not know when the dynamo actually ceased. Establishing this will be a key goal of the next phase of lunar magnetic studies. We also do not know the absolute direction of the lunar field, since all of our samples were unoriented rocks from the regolith—the fragmental layer produced by impacts on the lunar surface. If we could find a sample whose original orientation is known, we could determine the absolute direction of the lunar field relative to the planetary surface. This transformative measurement would then allow us to test ideas that the moon's spin pole wandered in time across the planetary surface, possibly due to large impacts. If The moon wasn't tidal locked at the time and was still spinning wouldn't the Earth's gravity cause the the Moon's still molten core to try and slosh back and forth like the Moon causes the tides on Earth to follow it around? I'm having difficulties grasping how the planetary dynamo works. Presumably there's convection driving molten material up from the core, and the coriolis force caused by rotation makes it spin around the core as it rises and sink back down at the poles, creating a kind of doughnut shape spinning current of molten material. This creates the necessary loop that is responsible for the dynamo effect. The problem I'm having is, if it's just molten metal or rock, why does it generate a magnetic field? A moving charge gives rise to a magnetic field and vice versa, but the rocks are neutral. Therefore, it must have a non-neutral electric charge to work, therefore the question: why? Is there some sort of radioactive process going on that leaves the molten material electrically charged? Charged relative to what? I am curiuos for few billion years how many centimeters cosmic dust should accumulate on the surface of the moon? When we talk about the planetary dynamo must be aware of the broad fact that permanent magnets weaken with time. Earth's magnetic field has weakened by nearly 6% over the last 100 years. To work dynamo billions of years, the permanent magnet in the planet's core must keep its strength during this period, which is impossible for me. It does not seem possible, the constant generation of heat in the interior of the planet or satellite for billions of years due to tidal forses because this will be at the expense of the kinetic energy of rotation and will slowing it down in the flow of time. It does not seem possible, the constant generation of heat in the interior of the planet or satellite for billions of years due to tidal forses because this will be at the expense of the kinetic energy of rotation and will slowing it down in the flow of time. Nuclear decay is thought to be the major contributor to the heat budget of our planet aside for the leftover heat from formation. You have to realize that the earth is still essentially a 12,000 km wide molten glob with a thin insulating 12 kilometer shell and about 100 km of air on top. It's just compressed to such a degree by its own mass that it doesn't flow very fast. The main sources of heat are the heat left over from formation, the heat released as the heavier elements sink towards the center and release their gravitational potential, and radioactive decay. Tidal forces play a very minor role in this. It's interesting to note that a kilogram of any substance has the potential energy of about 30 MJ relative to the center of the earth. It's about equivalent to the energy of burning a liter of gasoline. When the heavier elements in the mantle slowly sink towards the core, they release this energy as heat of friction along the way, and the complete stratification of the earth so that all the heavy elements end up in the center will take billions and billions of years. The centre of the moon would be wall to wall molten core, surrounded on all sides by rock, there'd be no space in which to 'slosh back and forth', but it would be revolving. Another one of the wackos who manage to get a PHd without a bit of common sense in their heads. What they are looking at is an absence of a magnetic field today, not an absence of a molten core, they detected a volcano that is supposed to be pretty recent on the moon not to long ago. That means the moon could have a magnetic field today, it just may be absent as the field is changing direction just like the earths field is changing direction. To make claims that the field stops billions of years ago when they have no data from rocks laid down sooner than that is pure wacko science. If you do nothing but wiki the subject, the core is claimed to be about 40 percent solid, that leaves 60 percent melted in which currents could flow and a magnetic field could be generated. To make the claim the moon has no magnetic field is pure nonsense. They simply do not know. @24volts: A geodynamo works through convection. Models of the Moon formation show that it was tidal locked within 1 kyrs. But its magnetic field lasted much longer. I agree that the tidal forces can have a share in the heating of the interior of such a celestial body, but this energy is at the expense of the kinetic energy associated with its rotation around a more massive celestial body and around its own axis. Another part of the energy supporting hot its interior is possibly due to radioactive decay. But in both cases we can not talk about the processes acting over billions of years. Generally assumptions can be true, but we usually interested in our measurement and quantitative relations. The strange thing is that there is such a significant difference in the chemical composition and internal structure between solid satellites orbiting gas giants in our solar system when they are formed from a common homogeneous proto cloud. Some have a heat source but others do not. Some are rotated in one direction, but others rotate in the opposite direction. @viko: "But in both cases we can not talk about the processes acting over billions of years. Generally assumptions can be true, but we usually interested in our measurement and quantitative relations." We are interested in measurements and quantification, which is exactly why we talk about processes over billions of years when we do have those observations (e.g. star evolution, planet system evolution, geological evolution, radioactive isotope activity, biological evolution, et cetera). "The strange thing is that there is such a significant difference in the chemical composition and internal structure between solid satellites orbiting gas giants in our solar system when they are formed from a common homogeneous proto cloud. Some have a heat source but others do not. Some are rotated in one direction, but others rotate in the opposite direction." It is strange only when you lump bodies formed under different conditions. Counter-orbiting moons are captured, as is statistically as many co-rotating ones. Those are often created further out in the disk. The disk was never considered to be homogeneous, which is why there is an ice line for water and similar differences for other volatiles, why the debris bodies are thoroughly heterogeneous, and why the asteroid debris belt bodies differ from the Kuiper debris belt. The latest observations, as reported here on phys.org this year, tells of possible mixing and shocks throughout the disk, mixing and differentiating it. Thank you Torbjorn and nkalanaga to bring us back to science. Previous comments are surreal.